All 120mm rounds use a common combustible case which structurally combines the ammunition'scomponents prior to firing and is completely consumed during firing. 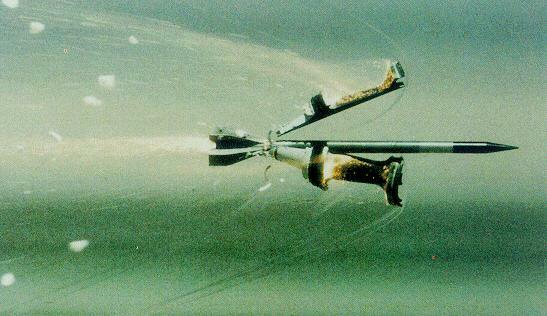 The combustible case is the primary reason for the superior interior ballistics performance of the 120mm ammunition. 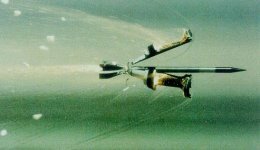 This breakthrough in cannon ammunition technology allows both a greater chamber volume for the propellant and a higher working chamber pressure, thus giving the rounds greater muzzle velocities and higher ballistic efficiencies. The combustible case also minimizes round weight and, because the metal base is the only element ejected, the armount of spent cartridge case material and propellant gas within the tank is is greatly reduced. While the combustible case is thoroughly consumed during firing, further assurance of a clean tube and chamber for each successive round is provided by a cannon bore evacuator. The evacuator functions as a large vacuum device, sweeping all portions of the barrel interior free of the most minute particles. 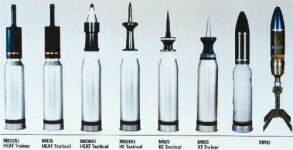 All 120mm rounds have a propellant containment device that prevents propellant spillage if the combustible cartridge case is damaged. The 120mm smooth bore cannon system was developed by West Germany for the Leopard II tank. The ammunition produced by both countries is interoperable and interchangeable between the Abrams and the Leopard, thus ensuring maximum commonality within the NATO community.